When I was young, Hong Kong was my summer break and Christmas holiday destination almost every year as my mom grew up there before marrying my dad. Hong Kong always meant playing with my cousins, get togethers with aunts, uncles, grandparents, shopping, eating, eating and lots more eating. I miss Cantonese food and even if I can get it elsewhere, there are just some foods that remind me of my second home, foods that you can only find there, or foods that just taste much better there, from wanton noodles soups to dim sum to barbeque meats over rice. Follow me as I show you the foods that remind me of Hong Kong and the places where I would get my foodie fix. Don't be afraid to try the local establishments, tourist popular restaurants are not always the best place to get good, authentic, quality food. 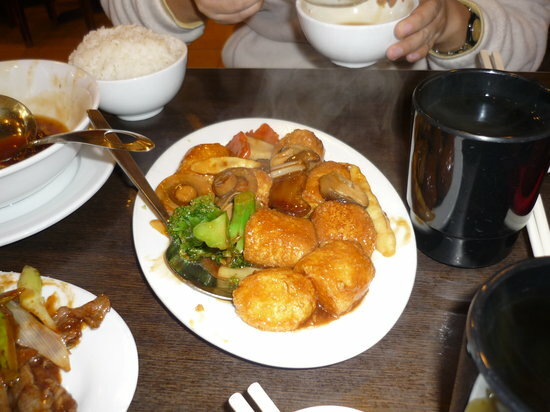 Cantonese cuisine is one of the best, if not the best food among all Chinese regional versions, so don't leave Hong Kong without at least trying the local food. 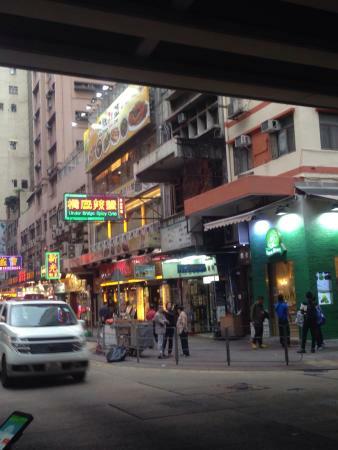 There's always a line for the restaurants in Hong Kong, even if it's not the lunch rush. Try to have your meals at a different hour than most people usually do, earlier usually works and you'll get a better chance of a table. Wanton Noodle Soup to me is the best reminder of Hong Kong food. 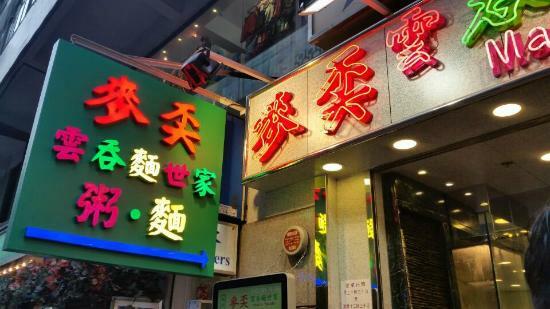 Many places today can boast of good wanton noodles but I think the best is still in Hong Kong and unfortunately, not every noodle shop serve it the way the good old quality dishes were prepared decades ago. 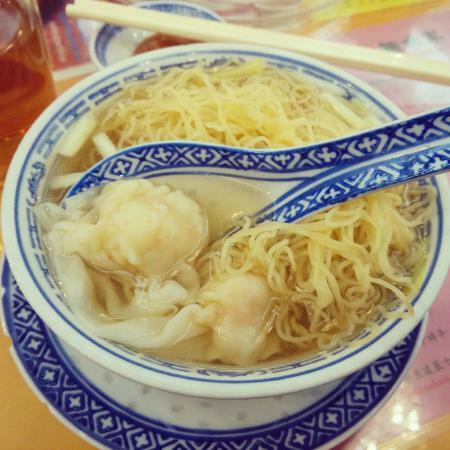 Up to this day, there is no trip to Hong Kong for me without a good bowl of Wanton Noodle Soup. The firm but thin noodles is key to good wanton noodle dish and that's what's hard to get anywhere else. Problem usually with thin noodles is that if cooked a little bit over, and you get soggy noodles. Good wanton noodles are never soggy. And of course, nothing taste as flavorful as the sweet shrimp flavored broth that is made from fresh ingredients yet made to be light and refreshing. The wanton dumplings are made with fresh shrimp meat covered with a soft thin wrap and almost crunches when you bite into it. "Wantan Min", as they are pronounced in Cantonese, were probably the first Cantonese words I knew how to say. It just shows my priorities :-) Today, I go to Mak's Noodle for that original quality noodle soup and I'm never disappointed. 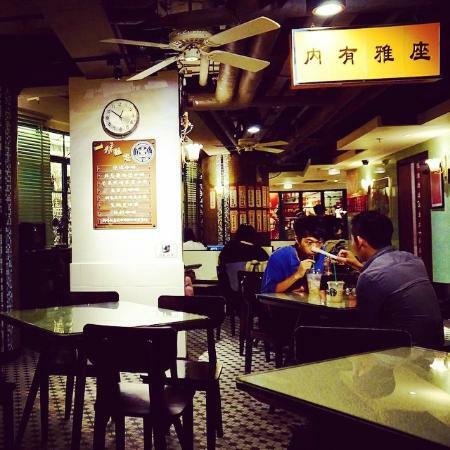 The noodle shop is small, so be prepared to wait and share tables with other guests, a typical setting in Hong Kong's tiny restaurants and cafes. 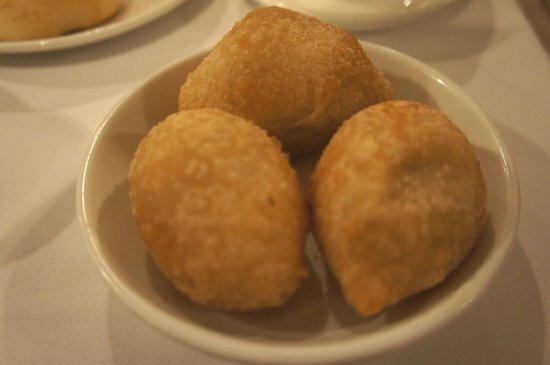 When one thinks of Cantonese cuisine, dimsum will always come to mind. 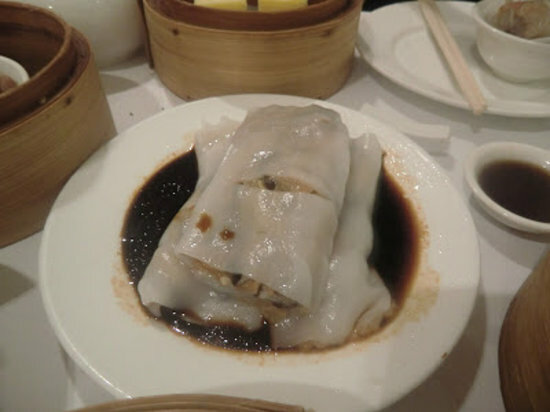 Dim Sum refers to the local snack size dishes that are served, typically on steamed bamboo baskets. You can also hear other people say "Yum Cha" like "drink tea" because it's usually eaten while drinking tea. This is available only late morning till mid afternoon and groups will come to have dim sum and sit and eat for a couple of hours while chatting with friends or family. I still remember enjoying seeing the ladies pushing the traditional pushcarts full of stacked bamboo steamers going around the restaurant. And when one comes near, we would peek in to the steamers to see what they have. It's very interesting especially when we were younger to anticipate what surprise these steamers would bring. Sometimes, patience fails and we'd have to go after a pushcart that we hope would contain the goodies we want. 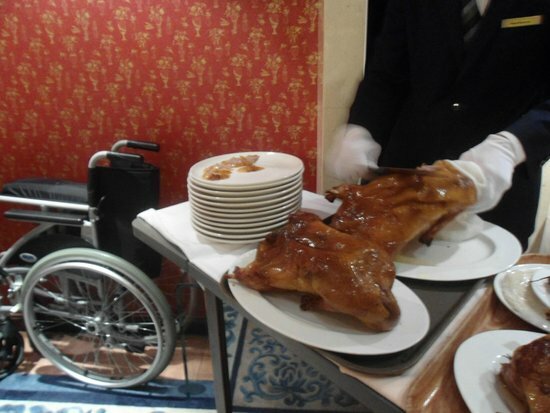 Today, a lot of the restaurants do not have these pushcarts anymore, mostly due to lack of space. Instead, you order from the menu. When you sit, they'll ask you for the type of tea you want. Here are some choices: Oolong (Tee Kuan Yin) - said to lower cholesterol :-), Jasmine (Heung Pin), Chrysanthemum (Kok Fa) and Black Tea (Po Lei). 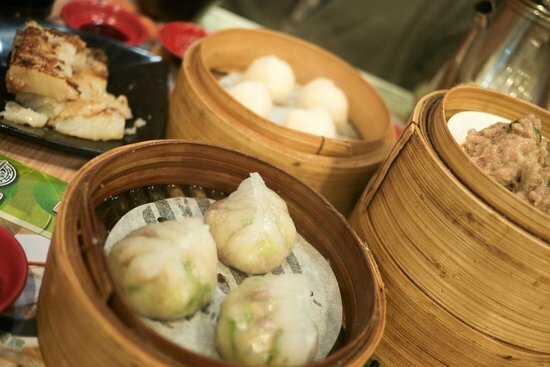 Like any cuisine, there are some mainstays which include shrimp dumpling (ha kaw), pork dumpling (siu mai), pork bun (cha siu bao), pan fried raddish cake (lo pat ko), pork or shrimp rice roll (cheoung fun), beef ball (ngao yok gao), sweet pork glutinous dumpling (ham sui kok), taro puff (wu kok). Everything was served hot and each dim sum plate comes with fresh and good quality ingredients and flavors. 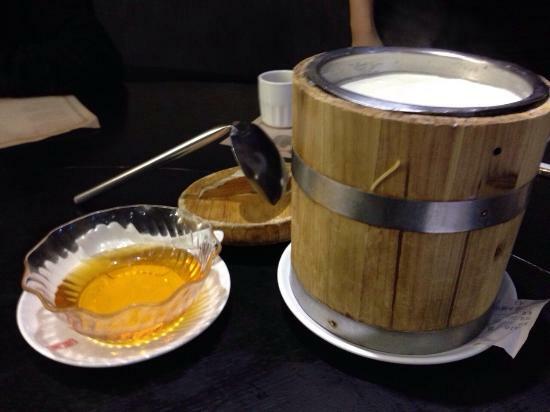 And our favorite desserts would be the hot almond milk, hot peanut milk, hot sesame milk or the more common egg tarts. Throughout the years, many more variations are being served and all you need to do is peek through the steamers, works despite any language barriers :-) I would recommend the following as they are not usually available in other countries: Chui Chow dumpling with pork, shrimp, peanuts (chiu chow fan guo), bbq pork in flaky pastry (cha siu saw), and the doughnut crullers (Yiu Tiao) wrapped in rice roll. As soon as you get a dish, they will stamp on the little card they give you at the start of the meal. Each type of stamp represents a category of dish and determines the price of each of the dishes. At the end of your meal, you'll be asked to give the card and they'll issue you the bill. Come early, around 11am and not later than that, especially on weekends, to ensure you get a table. 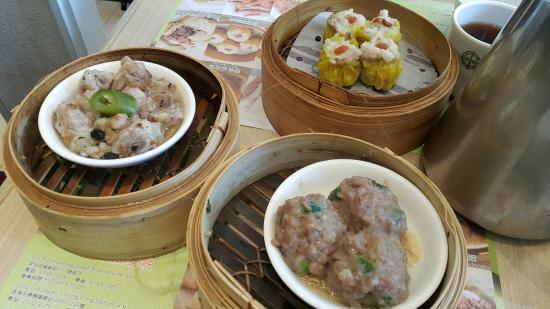 When one thinks of Cantonese cuisine, dimsum will always come to mind. 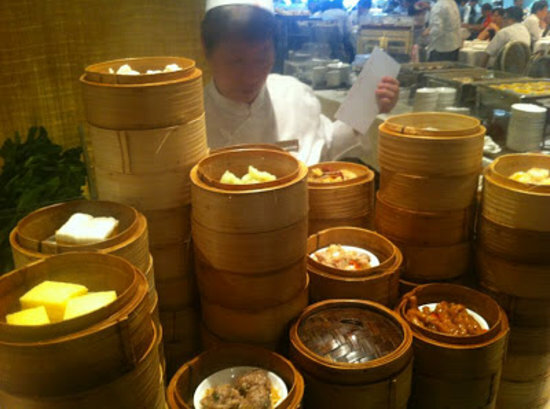 Dim Sum refers to the snack-sized dishes that is usually served in steam bamboo baskets. You can also hear other people say "Yum Cha" like drink tea because it's usually eaten while drinking tea. Traditionally, this is available only late morning till mid afternoon and groups will come to have dim sum and sit and eat for a couple of hours while chatting with friends or family. However, these days, a lot of these dimsum restaurants serve it the regular way, with a menu. This is good especially for office workers who have a limited lunch break. 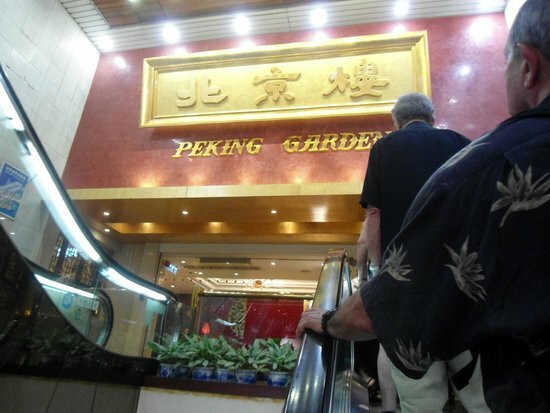 If you want to have a quick lunch and experience dim sum, then this is the place to go. But not too quick, there is also a queue. 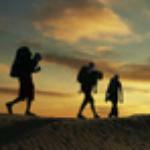 But since people eat and go, the turnover is quick and you'll get your chance to eat eventually. 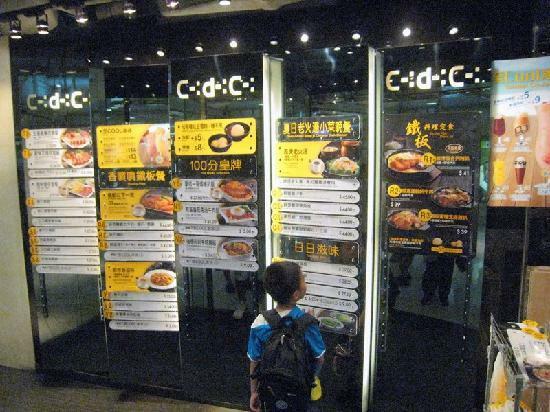 You'll see queues in most of Hong Kong's restaurants. This just means one thing, the food is good and worth waiting for. They give you a check list for the menu and you can just tick off what you want, and they'll serve them to you on the table. 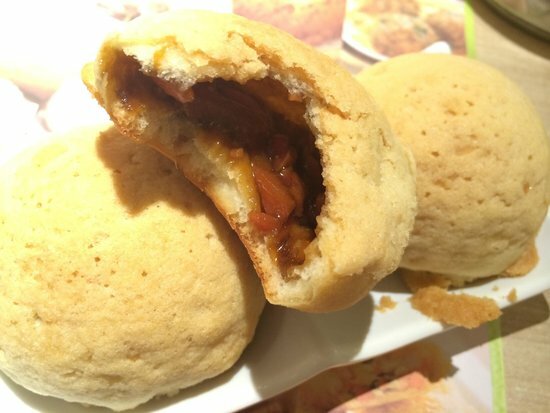 Their specialty here is the baked barbeque pork bun, a creative variation of the typical steamed version. The bun is just crisp and light, despite it being baked. 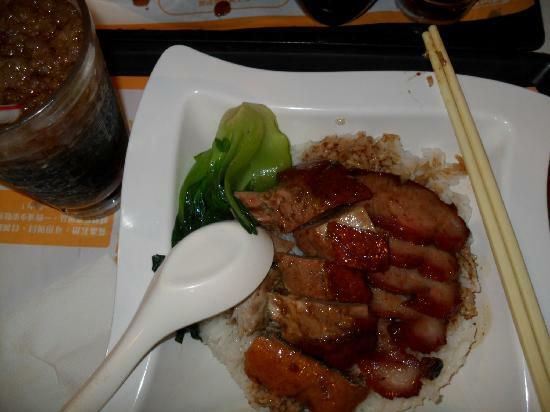 One of the most classic food in Hong Kong is the barbeque meat over rice. When we were kids, we'd get a giant plate of steaming white rice and different barbeque meats on top. You can choose a combination from the following: bbq pork, roast suckling pig, roast duck, roast goose, soy chicken, or white chicken. The sauce made from the drippings are the best and they've always managed to keep a good balance of the sauce for both the meat and the rice. This is a quick meal and usually a filling one. We used to go to Food Street in Causeway Bay for this, but since they closed, we've been going to Cafe de Coral most of the time as they serve tender and juicy barbeque meats. They also serve other delicious local comfort meals that one can try. A lot of locals eat here too. One time, I was on my own and was sharing a table with an old grandpa who sat beside me. He made small talk and spoke to me in Cantonese, which I understand a bit. After his meal, he gave me a coupon for a free meal next time :-) He told me that he'll not be returning before the coupon expires. 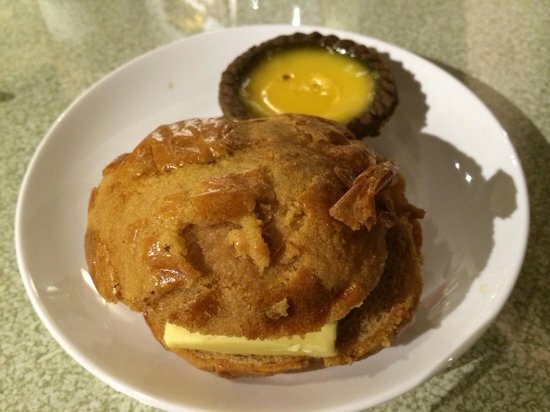 Sweet Dynasty is our favorite place for yummy desserts when you're in the area. 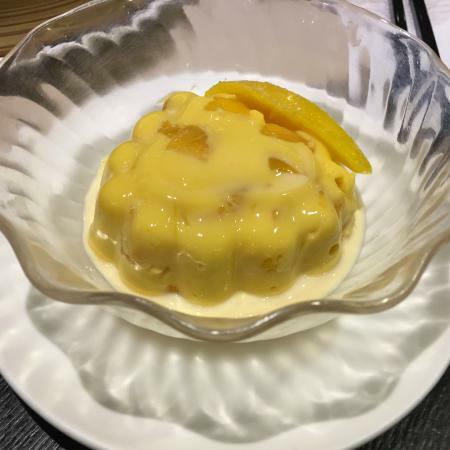 You can get good Mango Pudding and Soy or the famous Tofu Pudding (Tao Fu Fa) with sweet Ginger sauce. Lately, this has also become our favorite for congee in the mornings. They do not open too early, only around 8am, but they serve really good congee. My mom used to say great congee is just the right consistency/thickness and even when you dish out the first few scoops, the rest do no get watery. 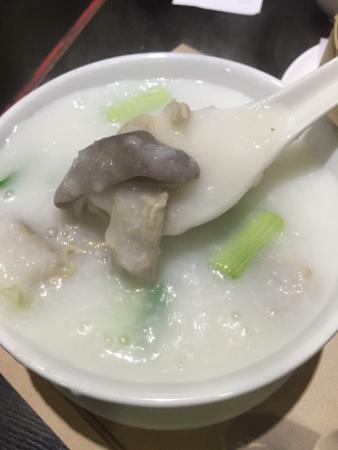 I also love the congee in Hong Kong because it's flavorful even without the toppings. 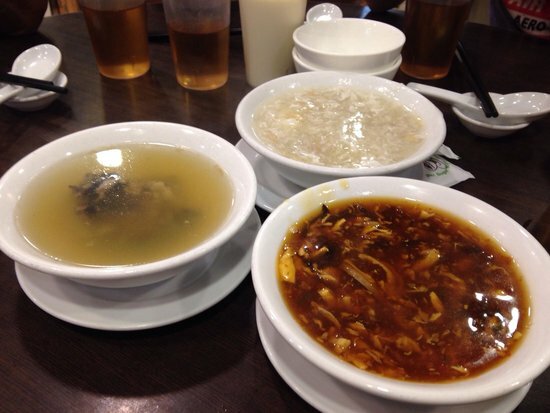 Some of the common congee flavors include meatball, fish fillet, century egg with chicken strips, abalone and beef. I sure love the thin strips of beef, something we don't get in congee in other countries It's topped with fried doughnut crullers. In the menu this time, they also offer shrimp as a topping and it has become our favorite dish, second to meatballs. Peking Duck was always a childhood favorite and I enjoyed this dish because there's always a whole ritual of carving and slicing the duck skin and meat in front of you. It reminds me a lot of a feast where family and friends would get together to enjoy a special meal. 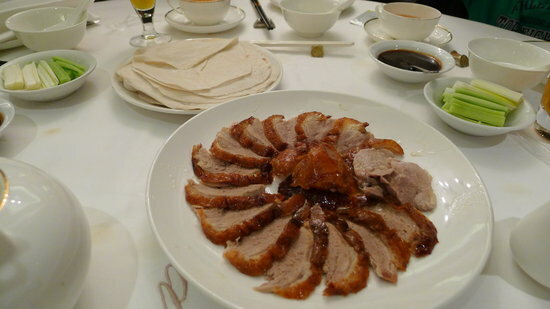 The duck is usually prepared in two ways, the prime skin and meat is served wrapped with a thin flour-based wrap and the rest of the meat is cooked a second way. I usually love the minced duck on lettuce wrap option. The others are usually very traditional and as a kid, I didn't like it. Order some winter melon soup to provide a light refreshing dish as a balance. And banana fritters for dessert. They are to die for. Historically, this comes from China, and that is why it's called Peking Duck, Peking is another name for Beijing, a city in China. But I've always had the best versions in Hong Kong though so this has been associated with my favorite Hong Kong dishes. I'm not sure how we came about Delicious Kitchen, but I think this is a perfect example of local comfort food. We can find the foods that mom used to cook at home and there's also some unique dishes that you can only find here. 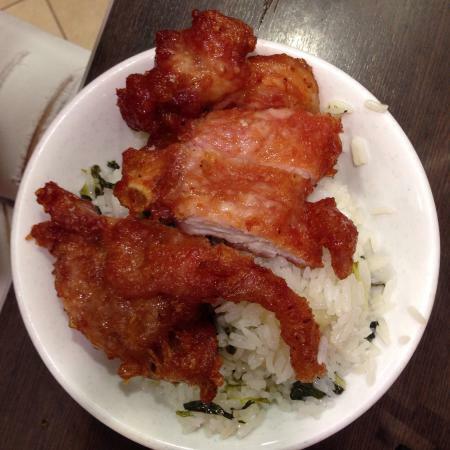 As an example, we love the double pork chop ribs and fried rice with mustard greens here. I think it's quite unique and you can't easily find dishes like this in other restaurants. Typical home-cooked dishes include the fried yellow fish with sweet and sour sauce. 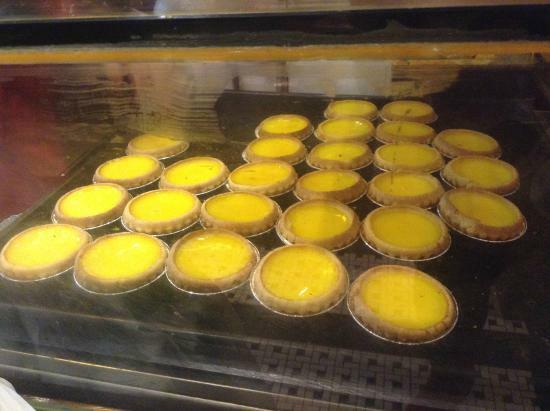 As a child, I was always pretty excited for dessert, because it means I get to have an egg tart or two. I've had egg tarts before, but nothing beats the egg tarts in Hong Kong where the middle yolk is so smooth and light. Even a raw egg yolk doesn't seem to have that fine texture. The pastry is also crisp and light, and layered with the thinnest pastry thins. I could eat a couple of them in one sitting. 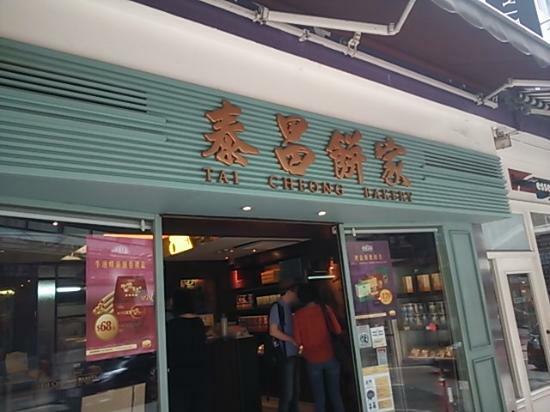 Nowadays, I go to this bakery in Wan Chai for the best Cantonese style egg tarts. 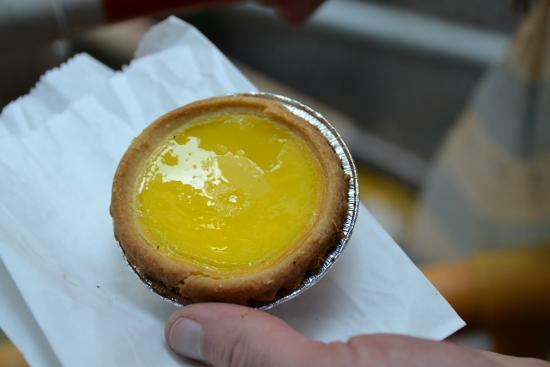 Don't confuse this with the Portuguese egg tarts that are sold in Macau, just next to Hong Kong. Portuguese egg tarts have their own charm, but nothing beats the crisp and light airiness of the Cantonese style egg tarts (tan ta). Well, you'll say Starbucks isn't local. True, but wait till you enter this Starbucks branch. 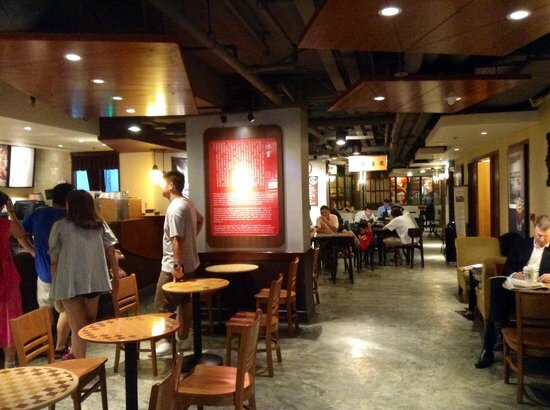 You'll feel like you've entered a local chaa chan teng or local tea house. It's decorated retro style which is quite interesting. I can't help but feel a bit of nostalgia. They even serve the traditional butter on toast or pineapple bun with a thick slice of butter, a popular local breakfast dish. Although this does not seem like a local shop, Hong Kong folks love anything Japanese, and they love anything Hokkaido. Well, I can't blame them as Hokkaido is well known for its excellent dairy products. 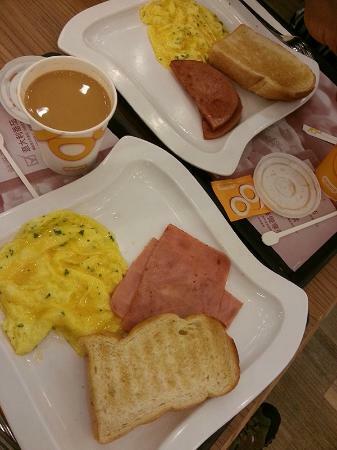 Order a french toast and cold Hong Kong milk tea. The french toast is made of thick slides of bread but yet it's the lightest and fluffiest french toast I've had. Milk Tea comes in a traditional metal cup. I don't really advocate going to touristy establishments but this one I enjoyed the spicy crab too much. 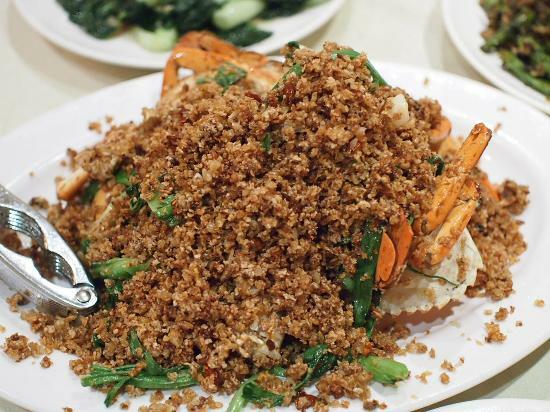 Seafood meals are usually pricey too, but hey, once in a while, I'd splurge a bit :-) Seafood is always something that I enjoyed as a kid in Hong Kong, and these meaty crabs with the tons of fried spicy garlic bits just awakens my taste buds every time. 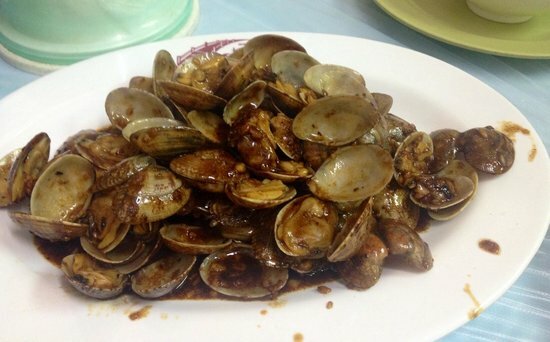 I also love the fresh clams with black bean sauce, also a classic staple for our seafood meals.